The Budweiser Clydesdales will be in the 30th annual Delaware All-Horse Parade on Sept. 13. Details are still being worked out, but the eight horses will be housed at the fairgrounds in the days leading up to the parade. “The 10th is going to be their shampoo and bath day,” said Jeri Jenkins of Columbus Distributing and Delmar Distributing, which represents Budweiser locally. A single horse will attend events at Polaris on Sept. 11 and the 10th annual Ohio Fallen Heroes Memorial Ceremony and Gold Star Family Reception in Sunbury on Sept. 12. The eight-horse team will be hitched to a beer wagon, with a Dalmatian joining them alongside the driver, as they travel the three-mile parade route at 3 p.m. Sept. 13. In addition, there will be times for the public to see the horses in the barn, Jenkins said, including watching them get harnessed on Sept. 12. Diane Winters, chair of the All-Horse Parade, said she had been trying since last October to bring the Clydesdales to Delaware in 2015. “They’re all-American, like apple pies,” Jenkins said. This will be the third official appearance for the Clydesdales in Delaware. They first appeared at the 15th All-Horse Parade in 2000, and at the county fair in 2008 (just missing Hurricane Ike), Winters said. However, the Clydesdales are no strangers to the fairgrounds — they sometimes stay overnight there when changing teams, because the facility has 14-foot by 14-foot stable stalls in the Jug or Jugette barn that can house the larger horses. A horse can eat 20 to 25 quarts of feed, 40 to 50 pounds of hay and 30 gallons of water in a day. At least six people travel with the Clydesdales at all times. When Lowe saw a big red Budweiser rig pull into the fairgrounds last summer, he thought, they’re here. A number of fans knew it, too, and they followed the semi into the fairgrounds, hoping for a glimpse of the horses. Other than public events, the Clydesdales can be viewed at Anheuser-Busch breweries in St. Louis, New Hampshire and Colorado. 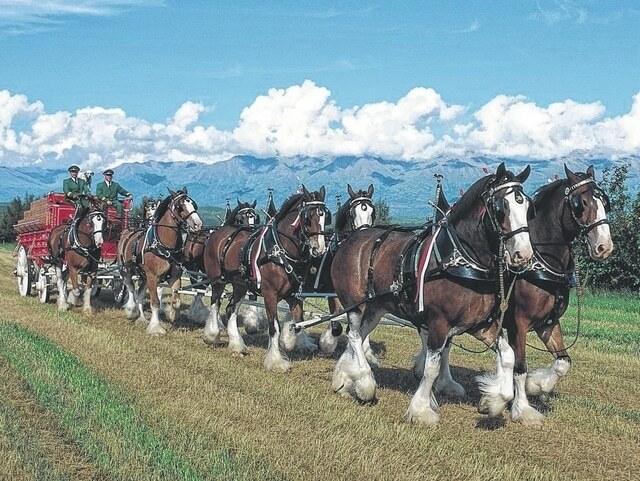 In a press release, Budweiser said that a Clydesdale chosen for a hitch must be at least three years old, be six foot tall at the shoulder, weigh a ton, be bay in color, have four white legs, a blaze of white on its face, a black mane and tail, as well as being gentle in temperament. The timing is good for the Clydesdales to visit, Lowe said, since the racehorses participating in the fair events won’t be arriving until a couple of days later. This year’s Delaware County Fair is Sept. 19-26. For more information, visit http://www.delawarecountyfair.com/fair/all-horse-parade.